in the classes section or call 707 236 2829.
you for a fun filled camp. Looking for a place to gather and make crafts inspired by nature? Join me on Wednesday mornings, 9am to 11am in downtown Sebastopol. Woodland animal ~ Felt an animal for your nature table. Pine cone Gnome Doll ~ Yes the Gnomes you can only purchase at Winter Faire! I'll teach you how to make these adorable little ones. Wet felted vessel - Perfect for a special crystal or small gift. Felted Sweater toy ~ Recycled sweater toy animal or ornament. I will share a story and craft. All materials are included, as well as tea and snack. This autumn I am going to hold a Mother's group in Sebastopol. It will be an opportunity for you to create a seasonal craft, and learn new seasonal stories to share with your family. I believe that creating a nature table, brings rhythm into a child's life. Children so enjoy the connection with nature and look forward to the changing seasons. In addition, I will offer play silks for sale and kits that you may create with your families. We will meet Tuesday mornings 9a.m.-11a.m. I will be sharing a craft and story each week. The group will meet at Glass Fusion Studio (next to Screaming Mimi's). I will be serving tea and snack. The fee per week includes all materials $25-$35 sliding scale. Please call Monica to register at 707 236-2829 Or visit the website monicaaashleydesigns.com for the current list of felting and sewing classes Monica has scheduled, through the end of the year. Santa Rosa, CA 5:30-7:30 $35. Nov. 9 Felted Nativity Workshop " " " " "
Nov. 16 Felted Nativity Workshop " " " " "
Nov. 30 Felted Nativity Workshop " " " " "
Deposit required to reserve your space. COME VISIT ME THIS SATURDAY AT THE BODEGA BAY ARTISIANS COOPERATIVE AND MAKE A GIFT FOR MOM! I WILL BE TEACHING A FREE WORKSHOP ON HOW TO MAKE A FELTED FLOWER PIN OR HAIR CLIP. Is there anything that says Spring more perfectly than a soft brown bunny hiding in the tender green cabbage leaves? 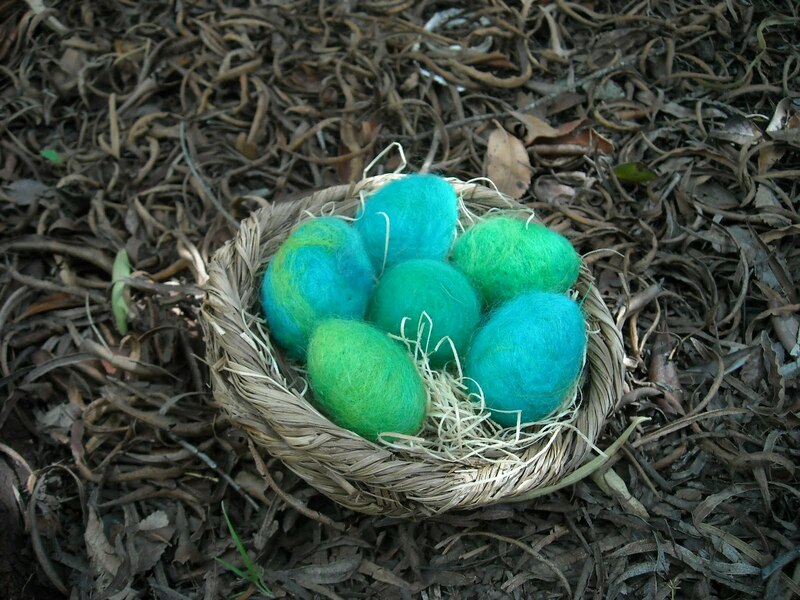 Monica Ashley, local crafting instructor, invites your children to learn to make their own Spring creation during the “Children’s Easter Bunny Workshop with Basket and Eggs“ this Saturday at Cast Away Yarn Shop. The class is offered on Saturday, April 16, 2011, 10:30 am – 1:00 pm. The cost is just $30, which includes supplies. 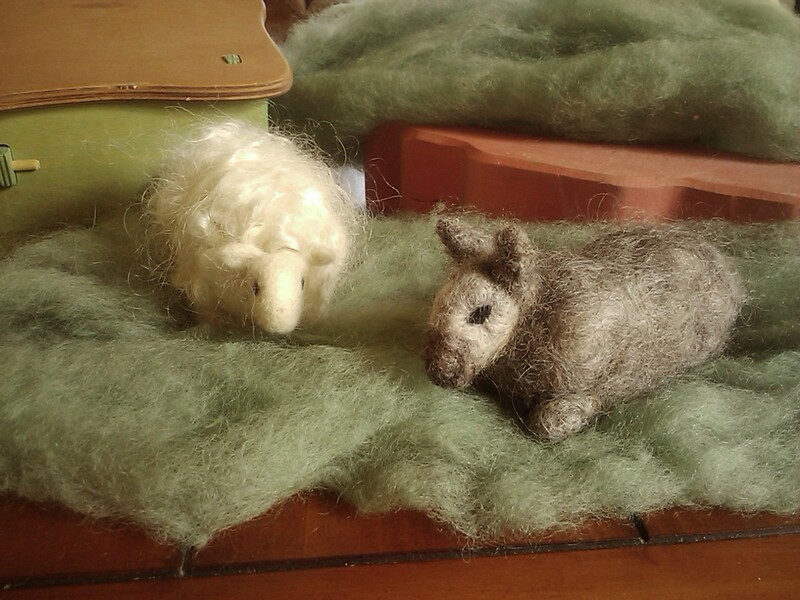 This fun needle felting classes is designed for children 8 to 12. Learn how to make a fun Easter Bunny with little eggs, just in time for Easter!” says teacher, Monica. Monica offers needle felting classes for more advanced students as well. This popular Peter Rabbit is just one example of the wonderful, whimsical details you can achieve with wisps of wool under Monica’s wing. Travel out the scenic Bodega Highway and find a tiny gem in the valley that lies on the edge of the Sonoma Coast: the quaint hamlet of Bodega. Forever famous for serving as Alfred Hitchcock’s the Birds’ film set, Bodega is home to a handful of charming antique stores. Bodega also has its very own Artisan’s Cooperative where a hand painted sandwhich board calls out “Meet Today’s Artist”. Venture into a clapboard cottage and awe over the unique works of more than 40 local artisans, including our beloved Monica Ashley. Monica invites you discover the amazing locally produced wool roving and yarns offered at the cooperative, while she guides you in learning how to create with wool. I will be hosting a craft camp during Spring break. Each day the children will bake, make crafts and sew or felt. We will create a natural bird house and egg decorating will be on Thursday.